THE SKINNY: Shine Shine Go Away Cleanser is supposed to be a cleanser that has the deeper-cleaning ability of a masque. It's made with kaolin clay, so the product has that mottled look and thickness of a clay masque. As promised, it does a good job of cleaning away the day's dirt and makeup without leaving my face feeling dry or tight. It rinses clean, so it's easy on the eyes, too. But does it really banish shine? Not for me (and my combination skin only has a few patches that get oily throughout the day). I didn't notice much of a difference. But for $6.99, it's not a bad option if you want to see how it does for your skin. KEEP OR TOSS: Keep. It works, just not as well as I want it to. 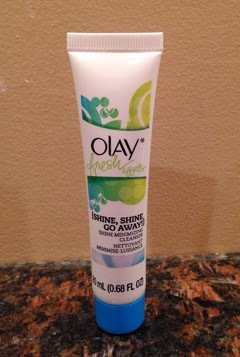 CHECK IT OUT: Olay says Shine Shine Go Away will remove twice the dirt and oil of a normal cleanser.